The New Brunswick Parking Authority (NBPA) is the organization for parking information in New Brunswick, NJ. The duties of the Authority are to construct, improve, maintain and operate offstreet parking facilities, to promote traffic improvements and the free flow of traffic. The Authority is also responsible for the management and operation of on-street parking by means of parking meters and residential permit parking. The NBPA maintains a uniformed security force to provide an adequate level of security in its facilities and to patrol the downtown area. 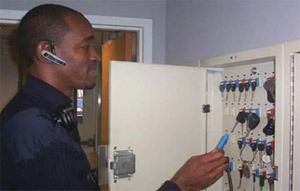 Apply a key control system that will tighten access to keys and allow management to more easily track and control the keys which are used for NBPA vehicles, administrative offices, revenue equipment (parking meters) and other Authority assets. The system additionally needs to be capable of remote access and programming so that emergency access to specific keys or other secured items can be granted instantly and without management physically having to be present. The NBPA has a fleet of 25 vehicles and the problem with a manual key control system (i.e. signing a key in or out) is that it would be difficult to determine, with certainty, which employee last drove a particular vehicle. Employees are requested to examine the vehicle prior to taking it out, making note of any scrapes, dents, etc., and then do the same when returning the car. When this is not done, it is very difficult to identify and prove who may have last driven the car or who was responsible for any damages and this can usually only be done by going back and checking logs which may or may not be accurate. Implementing a key management system with an audit trail would eliminate this problem. The NBPA is also responsible for the collection of coins from the various parking meters and keys to these meters must be carefully controlled and a verifiable audit kept, ensuring the integrity of the operation. In addition, lost or damaged keys can cost thousands of dollars to replace and knowing who last accessed a key can assist management in determining a remedial course of action. KeyWatcher® Key Control System — The KeyWatcher is a customdesigned solution that automatically records the access history of each key, including user, date and time of checkout/ return. By releasing assigned keys only to users with the proper authorization code, the KeyWatcher system helps to ensure that all assets of the NBPA are better secured and protected. The unit’s rugged stainless steel construction and near indestructible key fobs are designed for heavy use and the illuminated key slots make accessing and returning keys easier. KeyPro® Performance Software –The user-friendly PC application software delivers real-time polling transactions, status, alarm and reporting capabilities for the KeyWatcher system. Activity reports can be customized to trace key movements by time, date and user code or biometric access data. And because the software allows the KeyWatcher Key Control System to be conveniently accessed and programmed remotely via an IP connection, control of the keys can be more efficiently and safely managed. Additionally, priority email alerts can be sent to management to keep them informed of the whereabouts of high security keys such as those needed for parking meters. The KeyWatcher cabinet holds every key used in the organization – approximately 150 – and each user has defined access to specific keys. As well, the keys are programmed for the length of time they are allowed to be out and if the key is not returned within the scheduled time period, management is notified via a priority email alert. The KeyPro Performance Software generates reports which provide accurate and detailed information, such as which employees drove which cars and when, storage areas accessed, etc. The network connectivity of the system also allows management to remotely release any key, adding to the convenience and inherent safety provided by the KeyWatcher solution. For example, if on the weekend an employee calls in sick, management can go online remotely and release a key to the individual who is covering for the sick employee. Prior to the system upgrade to network connectivity, the NBPA used a “ghost” code for these incidents. The ghost code allowed a few senior managers to access most or all keys but it still meant that one of them had to physically go to the building to release the required key. The problem of unreported damage to fleet vehicles has been totally eliminated since the NBPA started using the Morse Watchmans KeyWatcher system. This is because the system provides management with fully detailed and accurate reports of who accessed keys for which cars and when. Management is also able to better limit access to keys which are used for collecting coins from parking meters. If an employee is not authorized to take one of these keys, they cannot physically access it. Also, when reported information is combined with images from video surveillance cameras that are installed in the parking garages, management can absolutely determine who accessed any of the revenue equipment and when. Learn more about key control solutions for fleet management.